Although I like to refer to my workplace as "the copy factory," many of my desk mates prefer the moniker "copy jungle," in reference, I assume, to the thick tangles of copy we have to cut through each day. 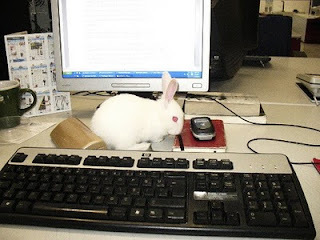 Today, for the first time, the copy jungle was inhabited by an actual animal -- the bunny rabbit that one of the page designers apparently decided to bring into the office for the day. Aside from providing an adorable distraction from the drudgery of a Sunday at work, our fuzzy visitor also prompted the revelation from one of my fellow yabancı co-workers that she had no idea what the city's fortune-telling rabbits were all about: "I thought people here had never seen a rabbit, so they were paying to pet them!"